(Bloomberg Opinion) -- Where are the unicorns? China’s first batch of candidates for its version of the tech-focused Nasdaq is an uninspiring bunch. Nine companies have been vetted for listing on Shanghai’s Science and Technology Innovation Board, out of 19 that filed applications. They’re also tiny, planning to raise just $1.6 billion combined. That’s a fraction of the $5.4 billion Xiaomi Corp. took in when it sold shares in Hong Kong last year. The names will ring few bells with investors: Jiangsu Beiren Robot System Co., a producer of automation equipment; Wuhan Keqian Biology Co., a maker of animal vaccines; and Amlogic Shanghai Co., a distributor of electronics parts, are among them. There’s no sign of glamorous candidates such as SenseTime Group Ltd., the world’s biggest artificial intelligence startup; Bytedance Ltd., the developer of the wildly popular TikTok video app; or Ant Financial, the payments affiliate of e-commerce giant Alibaba Group Holding Ltd. If the objective is to get the next Alibaba or Xiaomi to sell shares at home rather than deserting China to list in New York or Hong Kong, then the Shanghai technology board still has a lot to prove. On Friday, the regulator responded to investor disappointment by urging patience, saying the new board would need a run-in period. For a country that has the most unicorns after the U.S., the absence of big names is curious. Equally odd are some of the companies that do plan to list. They include China Railway Signal & Communication Corp., a state-owned and decidedly old-economy firm. Hong Kong-listed China Railway will seek to raise 10.5 billion yuan ($1.6 billion) selling shares on the Shanghai board. It may not be the only state-owned enterprise to do so. Xiao Yaqing, chairman of the State-owned Assets Supervision and Administration Commission, said last week that China is encouraging SOEs to spin off units for IPOs on the tech board. 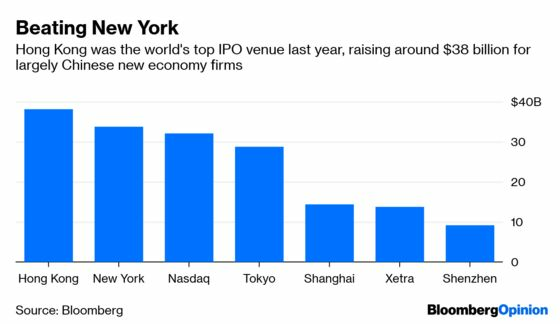 The Shanghai market may still present a threat to Hong Kong, the world’s largest IPO fundraising venue last year, and even to New York, which has also been a favored listing destination for China’s new-economy firms. A company can potentially raise far more money by selling shares at home because the new Shanghai market will remove an unofficial valuation cap of 23 times earnings on IPOs. The startup-heavy ChiNext index trades at a price-earnings ratio of 45. The tech board will be restricted to investors with at least two years of equity trading experience and 500,000 yuan of capital. There’s no shortage of money around, though. Domestic fund managers raised 124 billion yuan in anticipation of China depositary receipts, which have yet to be launched, while local equity mutual funds are holding as much as 13 percent of their portfolios in cash, according to Goldman Sachs Group Inc. analysts. Regulators have gone to lengths to make the Shanghai tech board an attractive destination for new-economy startups: Companies don’t need a profit track record and are allowed to use dual-class share structures. Listing will be via a U.S.-style registration system, meaning companies theoretically won’t need to wait in line to be vetted by the regulator. There are 1,800 companies waiting to sell shares on the main boards of the Shanghai and Shenzhen stock exchanges, including 265 that have already been approved, according to Goldman. Politics may see some big names opt for the Shanghai board, such as Ant Financial. The company’s lock on much of China’s digital payments industry means Beijing is likely to encourage it to list at home. Meanwhile, some surveillance-focused companies may find it hard to list overseas amid controversy over their business models. Even so, offshore will remain the favored IPO route for many startups, with some surveillance specialists rebranding themselves as "smart city" operators to win over foreign investors. Listing in Hong Kong or New York offers the chance to raise dollars and move money out of the mainland at a time of stricter capital controls, all beyond the prying eyes of Beijing regulators. Many Chinese technology companies have investment from foreign venture capitalists and use overseas accounting standards; switching to mainland standards is expensive and cumbersome. The Shanghai tech board may attract some exotic beasts. Unicorns are likely to prefer their overseas meadows. Nisha Gopalan is a Bloomberg Opinion columnist covering deals and banking. She previously worked for the Wall Street Journal and Dow Jones as an editor and a reporter.